You may be someone who likes to play around with new technology, but you also may be someone who either A) doesn't have access to an iPhone, or B) is too lazy/paranoid to put in the work required to load up your iPhone with iOS 7. 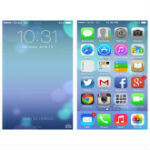 Luckily, Recombu has you covered with a new interactive virtual preview of iOS 7. Fair warning, the preview may take longer than you expect to load, and it seems to work better in Chrome than any other browser. It's also obviously not a full preview with access to everything you would expect, but it should give you an idea of the design choices that Apple has made with iOS 7, and the general feel of the OS. You'll be able to see the design of the stock apps, Siri, the multitasking menu, Control Center, and you'll even be able to take a picture of yourself if you're using Firefox or Chrome. It's definitely a fun few minutes of poking around, and certainly a lot easier than trying to load up the iOS 7 beta on your device (especially since you might end up having to roll back). But looks nicer than GS4 cartoonish kiddy UI. That was pretty crappy. Nothing really changed except the look. I liked the new look of IOS 7 more then I thought I would. Really cool tool.